Morgan Wright is creating a permaculture Eden around her home in Fayetteville, Tennessee. Although she originally planted straight rows of the food she and her family eats, she is converting these rows into clusters of companion plantings. She wants the garden to more fully integrate into her life, bringing joy, medicine, beauty, and fertility, in addition to food. By way of example, Morgan has a new garden patch growing nasturtiums, carrots, peas, cucumbers, and kale together. She will watch carefully to see how they do together. 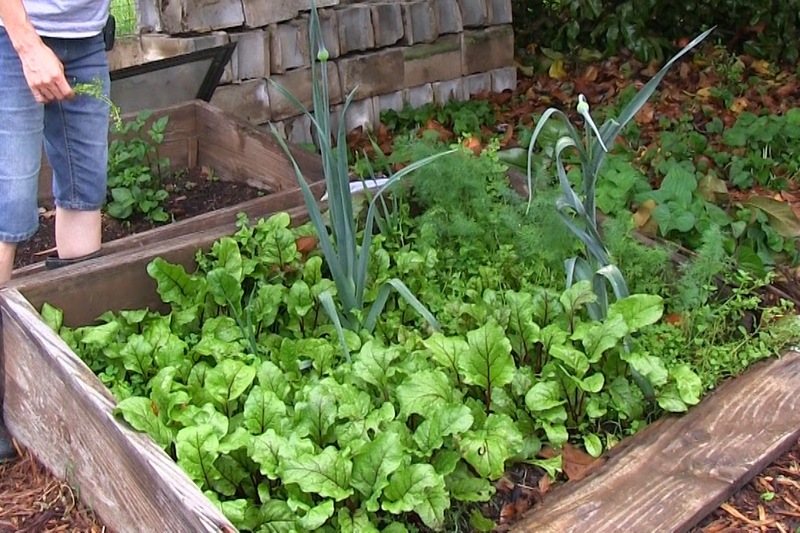 Back in February, Morgan planted a box of salad greens in a cold-frame that creates a warmer climate. Spinach is interspersed with cilantro, and three types of lettuce. The chickweed grew on its own, but is edible in a salad, so she lets it grow. Eat Wright Farms has a booth at the Madison City Farmer's Market, where they sell this salad mix. Once customers understand the nutritional value and good taste of wild-harvested violets and chickweed and henbit, they are excited about adding them to their salads. Morgan and Josh act on the belief that the weeds springing up benefit them. As she gardens, Morgan "harvests" the yellow dock leaves, and lays them down on the ground to mulch the surrounding plants. She appreciates that yellow dock roots have medicinal value, that dandelion leaves are edible, and that she didn't have to plant any of them! A second cold frame contains an inter-planting of beets and dill. As densely as these are planted, a couple of last year's leeks are coming back in the middle of it all. Morgan will let these grow in order to collect seeds from these two hardy plants. Morgan and Josh are passing on their expanding knowledge of plants to their customers and to their children. 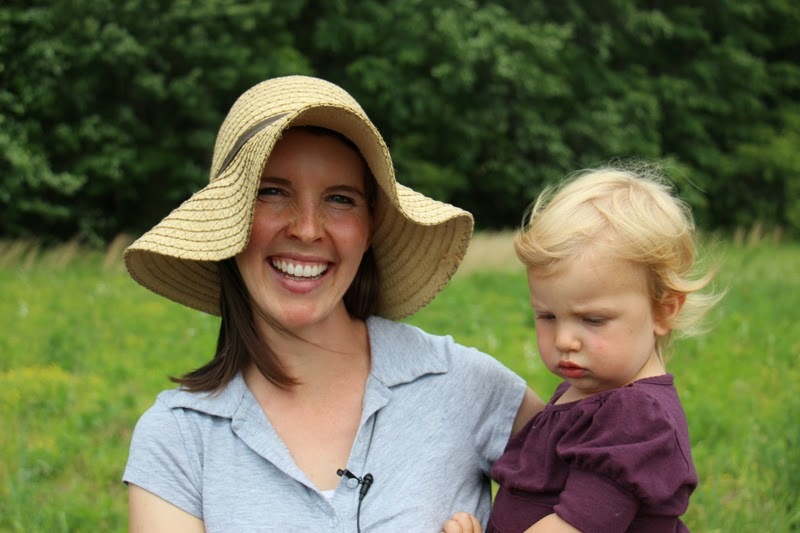 Their 3-year old son is well-versed in the tasty weeds that abound on their 2-year old, 6-acre farm. During the tour, he brought us some lambs quarters and sorrel to taste. And, amazingly, he liked them more than we did. I've never met a 3-year old that was head-over-heels crazy for salad. What a wonderful thing to bequeath your children. Give your son a couple of Big Macs and he will eat for a day; teach him how to identify tasty and nutritious wild weeds and he'll be set for life. Of course he'll need some protein as well. Josh and Morgan are also raising protein. They are raising sheep and chickens. They use the same rotational grazing pattern as that used by Many Fold Farm. First the sheep graze an area for a day, followed by the chickens a couple of days later. Each day they move the animals to a new area. Although this sounds straightforward, Josh is still trying to figure out the best management practices, to provide them shade in summer or a dry spot during prolonged periods of wet weather. 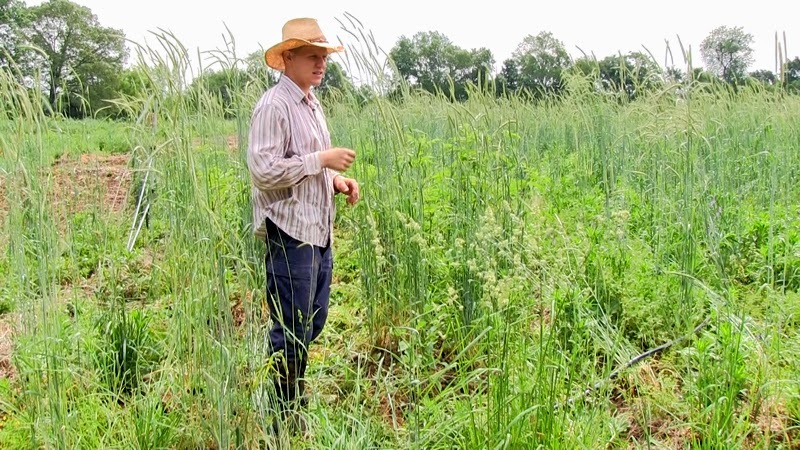 As new farmers, both Morgan and Josh are continuing to learn what works best for their farm. Morgan and Josh exude the idealism that young people are bringing to the permaculture movement. Permaculture is a contraction of "permanent" and "agriculture". Definitions of the term vary wildly and seem to generate a call to arms, when folks don't agree. I will venture into the fray anyway. Where conventional farming is characterized by monocropping, synthetic fertilizer, and toxic chemicals to control weeds, viruses and bugs; permaculture gardens follow organic methods and seek to reduce all inputs including fertilizer, herbicides, and pesticides. Where conventional farming is resource intensive regarding capital investment, water usage, and energy use; permaculture calls for water harvesting resource re-use, renewable energy. Conventional farming threatens our ability to feed ourselves by reducing biodiversity, and contributing to environmental degradation and climate change. And permaculture beckons to the idealism in most of us. It hopes to improve the prospects for many food insecure people. It promotes working with nature rather than continuing on a path toward climate chaos. It's core tenets include caring for the environment and caring for people. And it brings out a high level of enthusiasm from Morgan and Josh. Josh is a full-time firefighter and Morgan has an infant and a toddler at home with another baby on the way. And yet they are both dedicated to bringing their big dreams to life, transforming their farm into a sustainable enterprise. In practice, permaculture farms are organic, low-input, and biodiverse, and use techniques like chop-and-drop mulching, intercropping, planting perennials, hugelkultur, creating food forests, and rotational grazing. Josh and Morgan are moving forward on all of these fronts. They are going one step further and creating a commercial enterprise. They evaluated their business situation last year and decided that they had bitten off more than they could chew. They have downsized their sales operation for the current year, so that they can focus on putting in companion plants for their newly planted fruit trees and building a honey house. Since they are in the early stages of creating a farm, they don't expect a profit, until their initial investments are complete. Until then, they are reaping the benefits of healthy food, a teaching environment for their children, medicine from plants that grow locally, and the beauty of flowering plants. 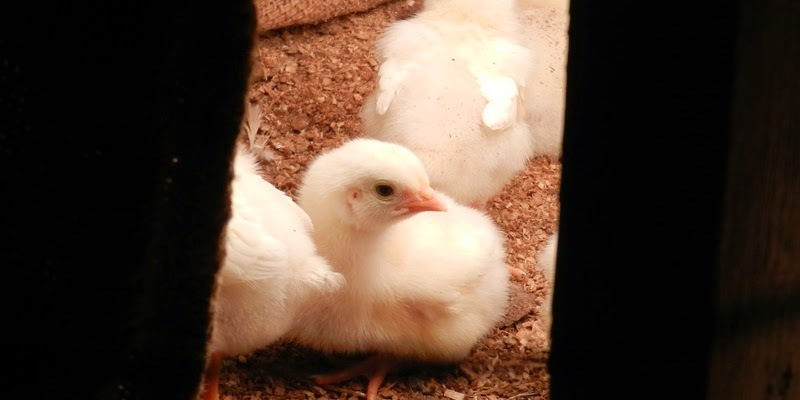 You can find chicken, honey, garlic, salad greens, potatoes, radishes, heirloom tomoatoes, and peppers from Eat Wright Farms at the Madison City Farmers Market in Madison, Alabama on Saturdays from 8am-noon.